Long, long before XBox and Wii and PS3, in the long-ago year 1147 AD, a gigantic glittering alien spaceship came to Earth to steal its treasures. Four young humans – an autistic apprentice scribe from England, a prince from the African castle of Great Zimbabwe, a Khmer martial art student from the temple of Angkor Wat, and an Anasazi hunter from the pueblos of Mesa Verde – were captured inside giant treasure-filled glass bubbles and carried up to the orbiting mothership. The ship was ruled by a purple tentacled alien named Zpu the One and when the kids escaped from their captors they vowed to force the horrid Zpu to surrender Earth’s stolen riches. The alien mothership is a boobytrapped maze and as the kids make their way toward Zpu their bravery and skills are tested by bizarre puzzles, living obstacle courses, battles with robots, and other strange challenges. Modern readers will realize that the kids are in the midst of a series of real-life computer games but the medieval kids must figure out the rules and goals while playing for their lives and Earth’s treasures. When the kids overcome their greatest challenge and confront Zpu, the alien congratulates them: they are only the third team of humans ever to win the Pirate Fleet Game. As winners they are invited to join the Great Galactic Games and represent Earth in the upcoming Galactiad – a game tournament entered by the best players from all known species. The Earth kids have become tight friends and decide to stick together and to travel to the Galactic Core to face the Galaxy’s ultimate challenge. My next book is Palin/Cheney 2012 and then I plan to write Castle Rising – Middle Grade sci-fi. Castle Rising is based on a game design I started in the 90’s. As I agent-hunted for Channel Zilch I noticed that a number of agents are asking for MG sci-fi and my old game design popped up as a scenario that would make a fun kid’s book. My first job in nailing down the book was to select the year it happens. I’ve been having a blast researching medieval history. The kids have to come from four extremely different cultures. My original game design was set in the 15th century and I knew that one kid had to come from the English castle named Castle Rising (purely because of the name) and another had to come from the African castles of Great Zimbabwe. As I read about cultures in the Americas and Asia I zeroed in on Angkor Wat and the Anasazi, which moved the date to the 12th century. I taught 5th grade and loved to read books out loud to my kids. I’m lucky to be in a writing group with Janice Hardy, author of the acclaimed MG fantasy series The Healing Wars. She is generous with writing advice so I look forward to picking her brain about MG lit. I rely on the other writers in Written in Blood to give me their usual fine counsel. I’m pretty sure the book will have 4 main characters, but I may have to reduce that to 3 for narrative reasons. So far I’ve only developed the English scribe character. Here are some notes on each of the current 4 characters and their cultures. Willa is an 11-year-old autistic girl who disguises herself as a boy named William. Willa’s mother decides that Willa can make a good living if she pretends to be a boy and apprentices as a scribe at Castle Rising. Willa stays in character as William until near the end of the book so I will refer to Willa as William/him. William is obsessed with books and language and writing. He especially loves working on illuminated manuscripts. In 1147 England was still absorbing the Norman conquerors. This period of turmoil was called The Anarchy because weak King Stephen fought to keep the throne from his sister Mathilda. Castle Rising was built around 1140. The castle will be encased by the aliens inside an enormous glassy sphere and lifted into orbit – so the name Castle Rising is rather apt. William’s love of language makes him the communicator and teacher of the group. William is able to talk Latin to the Zimbabwean prince right away and he teaches the other 2 kids Latin. I am a huge fan of the castles of Great Britain. I never visited Castle Rising but I spent many happy days crawling through castles when I lived near London from 1966-70 (Dad was in the US Air Force.) I hitchhiked often around Wales and Cornwall, staying in youth hostels and friendly driver’s homes, and I tried to visit every castle along my route. I hope to visit Castle Rising someday. One of the seeds for my Castle Rising game design was finding out that Africa has a complex of medieval castles called Great Zimbabwe. Margaret did a big school report on Great Zimbabwe. Most of the buildings of Great Zimbabwe were built after 1147 but the very cool Hill Complex was up and running in time for my book. The ruins of Great Zimbabwe were pillaged by white Rhodesian colonists determined to prove that the local blacks didn’t build them. They floated absurd theories about the gold mines of Solomon and Phoneocian and Arab invaders, but the castles are clearly the work of the early Shona people. There are no written historical records but I want to make the language and culture plausible. The prince knows Latin because his father gave him a tutor slave who was a Catholic monk. 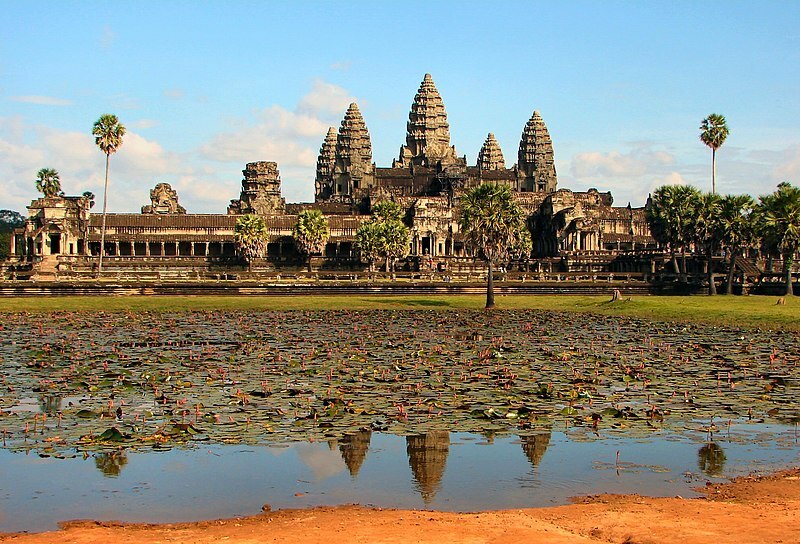 Angkor Wat was still being finished in 1147. It was constructed as a Hindu temple dedicated to Vishnu by Suryavarman II. He died somewhere between 1145 and 1150. I am setting the alien invasion on the day of his funeral. For my Cambodian character I’ve been researching the ancient Khmer martial art called Bokator, which is a martial art designed for use on the battlefield. Angkor Wat is covered with bas-relief sculptures of Khmer life and some of them show warriors using bare-handed fighting moves. I just finished reading a great book about 12th-century Angkor Wat called The King’s Last Song by Geoff Ryman. Highly recommended. When I was in 2nd grade I visited Mesa Verde with my Dad. I’ve always wanted an excuse to dive into Anasazi history and so I made sure to have an Anasazi character in Castle Rising. In 1147 the Anasazi had not yet build their cliff dwellings but lived in pueblo communities on the mesa top. One of the biggest communities is at the Far View site so I’ve chosen that as the home of my character. There is no Anasazi written history from the 12th century so events will be made up. There is a rich archeological record and the Pueblo Indians in the area are living descendants of the Anasazi who have maintained strong cultural traits over the centuries. Lots of fun research ahead of me to flesh out this character. I’m having a blast researching Castle Rising. I have to finish Palin/Cheney 2012 by mid-Summer and plan to start writing Castle Rising right afterwards. It’s a fun project that gets my creative juices flowing. I’d like to write a book that would make a great computer game.